The rooster began crowing at 4:45 AM and we awoke to the warm mountain breeze. We ate a large breakfast, said our thanks to the family whose house we had stayed in for the past few nights and hit the trail before 7:00AM. Everything seemed like just another day of adventure in Costa Rica. We quickly came to a river with a rickety cart suspended over it. Jokes about Friday the 13th quickly popped up in the group. We piled into the cart in pairs to cross the river. The cart bounced and swayed while we were in it, but eventually made its way across the river and was pulled back to pick up its next load. After hiking a couple miles down the trail, we came across the final home stay for the backpacking portion of our trip. It was a big open house built to hold large groups of people. A surprise was waiting for us upon our arrival. 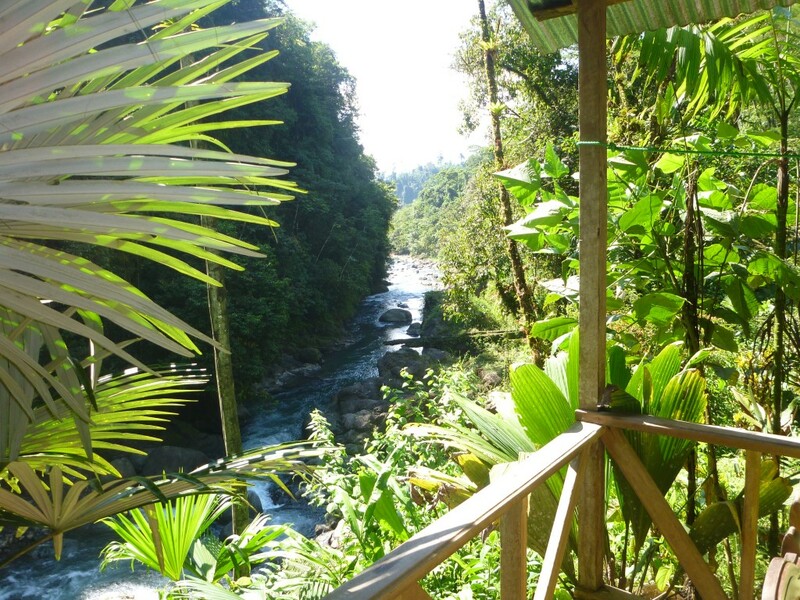 We were going to go zip-lining high above the river. Everyone was excited and it looked safe so we grabbed harnesses and helmets and rushed over to the area where we would zip-line. A few people at a time hiked around to the top of the line while the rest sat in the shade at the end of it right by the house. The zip line was about 100 feet from the ground and a few hundred feet long. It spanned an entire bend in the river. After everyone had zipped safely down the line and ousted our second opportunity for a Friday-the-13th tragedy in the backcountry, we went back to the house for lunch. The temperature had risen to 88 degrees Fahrenheit in the shade and was much hotter in the sun. Our lunch was accompanied by spicy salsa—which only made the day feel hotter. When lunch was over, a medicine man who also happened to be the owner of the home we were staying in showed us through his medicinal garden. He had plants to cure any ailment that a person could have and swore by them. He claimed that many of his treatments would do things better than what any pharmaceutical pill could do. He had plants for nausea, sore throats, and other minor illness as well as a plant that he claimed would cure irregular menstruation for life in as little as three doses, and also a plant he used to cure cancer. The medicine man told of a woman who suffered from leukemia and could not be healed through any of the top-end treatments. In desperation, she flew to Costa Rica and allowed him to treat her with this plant, by her next checkup, there was no sign of cancer. She never relapsed. We all listened to the stories in skeptical amazement. None were quick to dismiss the possibility of a plant that could do this, and all had heard of drug companies not releasing cures because they make more money treating an illness rather than curing it, but at the same time we were skeptical of the stories of a medicine man in the jungle telling us about curing a disease that scientists have been working for decades to cure. We soon migrated to the sauna on the riverside. A small rock hut required a squatting waddle to walk into. The movement brought me back to my days as a lineman in football. We sat in the sauna for 10 minutes then swam in the cool river for 5 minutes and repeated the process three times. I jumped in the water after the second time in the sauna, and just as I arose from the water, I heard a clunk. In horror, I turned around to see my leader, old enough to be retired, lying on his back with blood quickly staining the rock below him. On his way to the river’s edge, his feet had popped out from under him and his head broke his fall on the rocks. Without hesitation, Santiago and I (both trained as Wilderness First Responders) rushed to his side. The girls who were nurses also came quickly. The rest of the group gave space for us to work. Some offered to do whatever we needed as it came up while others shied away from the sight of blood. Everyone prayed continuously for our leader over the next few hours. The situation had potential to turn very ugly at any moment without warning. We treated the bleeding as best we could, checked for any spinal injuries, assessed his level of responsiveness (which was A&O X4, thank God! ), and ran through all the necessary procedures we needed to as wilderness first responders. Everyone worked together as a team. The nurse with the most training treated the large gash on the back of our leaders head; I did the spine assessment, checked LOR (level of responsiveness), and wrote the SOAP notes; Santiago jumped in and out to help wherever he could and also helped translate to the family at the house where we were staying. When we cleared our leader to be moved back to the house, we planned to carry him but he refused. We negotiated with him and allowed him to try walking so long as we could hold his arms in case he were to lose his footing. He consented. Once back at the house, we cleaned the cut, sterilized it, and re-dressed it with clean bandages. We discussed our options for evacuation if it became necessary and came up with a plan for how to proceed. We were several hours of hiking away from the nearest road, it was less than 30 minutes before dark, but luckily our leader showed no signs of even a minor concussion. Our plan was to wake the leader up every two hours throughout the night and re-assess his LOR, pupils, and other indicators of head trauma. If his state worsened, we would evacuate him in the morning by trail or with a helicopter if the situation called for it. Our leader was grateful to have so many medically trained people around him and he tried to be the best patient he could be. We stayed up and played cards with our leader to keep him attentive and continually monitored him until bed. We arranged our beds such that he slept very near Santiago and I and we monitored as planned. I monitored our leader at 1:00AM and 3:00AM and needless to say found myself very tired when I awoke early the next morning. Our leader had swelling outside of his skull but still showed no signs of a concussion. He checked out splendidly at each check throughout the night, and he was only slightly irritated from having his sleep disrupted. Our prayers were answered. A situation that could have been fatal and was likely to at least have complications was turning into just a scary experience on Friday, the 13th.